Mayor Murray’s HALA “GRAND BARGAIN” UPZONES! Bring your families · Bring your friends · Bring your neighbors. Voice your concerns about the MHA “Grand Bargain” Upzones to the Mayor. Mayor Murray is coming to Wallingford for a Find It, Fix It Walk this Tuesday March 14. The event starts at 5:00 PM in Woodland Park on the corner of Stone Way N and Green Lake Way N and N 50th Street. At 5:30 PM, the Mayor speaks and the Walk begins. If you can’t be on the walk, come to Densmore Ave N between N 44th & N 43rd Streets at 6:00 PM. We are gathering a crowd to greet Mayor Murray at Walk Stop #4. It is important for all of Wallingford to show up, be seen, and be heard. Decisions made today affect the cost of living and the quality of life for all residents of Seattle. Help get out the word – door knockers needed. Please email pres@wallingfordcc.org if you are able to help door knock over the next few days. BE SEEN, BE HEARD, BE THERE! 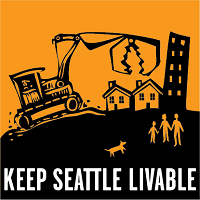 We will have “Keep Seattle Livable” signs to use, or bring your own! Don’t have time to make a sign—we will have extra signs! YOUR NEIGHBORHOOD CALLED & IT WANTS ITS VOICE BACK! GOING OUT OF BUSINESS due to NO PARKING! This entry was posted in Calls to Action, Land Use, Parking, Quality of Life, Schools, Transportation, WallHALA on March 10, 2017 by Frank Fay.